One of my favorite styles of narrative presentation is the concept of an intimate tale told on a grand scale. The idea that a personal, emotional story can be told against a broad, dramatic backdrop is both heart-warming and evocative, and with a deft touch, can prove to be very engaging. This is precisely the style of story-telling that Key – a prominent figure in the visual novel field – embodies, and their work in Planetarian: The Reverie of a Little Planet is no exception. In a post-apocalyptic world, humanity is struggling for survival while the cities are overrun by mechanized weapons. Our unnamed protagonist stumbles into a planetarium following a brief scuffle, where he meets Yumemi Hoshino, a cute robot girl serving as an attendant for the planetarium. These two characters are the sole focus of this story; it’s their interactions within the planetarium over the course of a few days that form the backbone of the narrative. It’s a very simple, low-key story of Hoshino and the unnamed protagonist bonding over a shared interest in astronomy, with a broken projector serving as the catalyst for their relationship. Outside of a few small hints as to the broader situation at hand, and an impending time restriction on the current situation, each episode is presented as a brief light-hearted, if somewhat melancholic glimpse into a blossoming friendship. On the surface, the two lead characters couldn’t be further apart, with no common goals, and wildly different idealogies. Simplicity generally works in the series’ favor though. While the developing relationship is somewhat hit-and-miss in its execution, a lot of charm and character shines through. It’s a slow start — which is usually a death sentence in such a short series — but by the series’ conclusion, it feels like a real bond has formed, and those final scenes carry a huge deal of weight. There are brief glimmers of wonder and genuinely engaging storytelling sprinkled throughout, but for the bulk of the series, our two protagonists generally feel bland and uninspired. Yumemi is initially endearing, with her unyielding enthusiasm and heart-warming naiveté, but she remains a rather static character through the vast majority of the series’ run time. Perhaps it’s a reflection of her nature as a robot, but in an intimate character drama, a little bit of development goes a very long way. She remains insistent on completing her duties as the planetarium’s attendant, which is certainly endearing to see, but her repetitive vocal patterns and dialogue can become quite grating. The slow build-up leads to a dramatic conclusion where she finally finds an answer to the one question that’s been plaguing her throughout the series: her purpose. As she engages in a lengthy monologue reflecting on her life up to this point, and the conclusions she’s come to, it feels like a bit of a leap in character development, but the scene manages to carry ample weight thanks to her incredible vocal delivery, backed up by a wonderfully evocative musical backdrop and heavy atmosphere. Our unnamed protagonist suffers similar problems, but ends up feeling somewhat more unilateral. He’s initially presented as a gruff, hard-edged soldier type, but as the series progresses, small hints of his kind and gentle demeanor shine through. These moments are intermittent, and are often followed by regressions to his stoicism, so it’s hard to feel like any major development is taking place. In an early episode, he makes the decision to remain in the planetarium despite the lack of supplies he was initially searching for. He follows this up with the seemingly reluctant decision to stick around and repair a projector for Hoshino’s sake. The two bond, and it’s a genuinely heartfelt sequence of events, but during the repair process, as well as after, his sarcastic, apathetic nature returns. It ends up feeling rather inconsistent, and the lack of definition surrounding the series’ conclusion certainly doesn’t help clear things up. As with Yumemi, the final episode serves as the most significant part in her development, but there’s no real payoff for the protagonist. Sure, it feels like something has changed within him, but it’s never clearly defined, and he ends the series as a rather complete enigma, just as he was at the start. However, something about the narrative in Planetarian managed to remain engaging. When viewed in isolation, the characters are weak and their relationship seems undercooked, but when the journey comes to an end, it all just fits into place. It’s certainly unusual, but Planetarian works as a character drama for the viewer, rather than the characters. 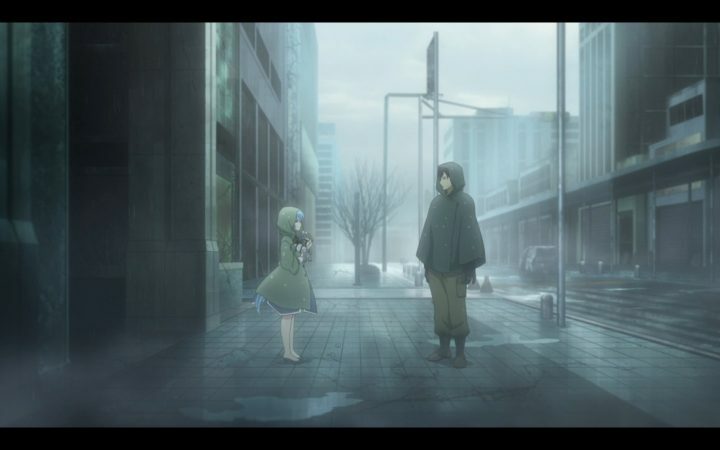 By loading all of the heavy-handed drama in the tail end of the series, you leave with the impression that some significant emotional drama just unfurled. Those brief glimmers of inspiration throughout serve to carry the viewers’ attention through to that closing sequence. Though this does leave the first half of the series quite bare, when those credits finally started to roll, it all just started to connect. Though its use is rather minimal in the series’ narrative, the post-apocalyptic setting makes for an interesting backdrop. It’s only mentioned intermittently, and no specifics are ever explained, but it does provide a layer of tension. The impending time restriction based on the lack of electricity and supplies, as well as the intermittent shots of the outside world help cement a rather oppressive atmosphere throughout the series. When the outside world is finally explored in later episodes, it becomes apparent just how dire the situation really is. Although I feel that digging deeper into the background would detract from the character-focused experience that the show is going for, more questions are brought up than answers. It feels like the story is building up to a major reveal, but never quite makes it to that point. It ends up feeling a bit uneven, though by nature of being a short character drama, the omission of background details is at least somewhat understandable. Key has a bit of a reputation for creating incredibly emotional stories, with titles like Clannad and Angel Beats among their extensive library. 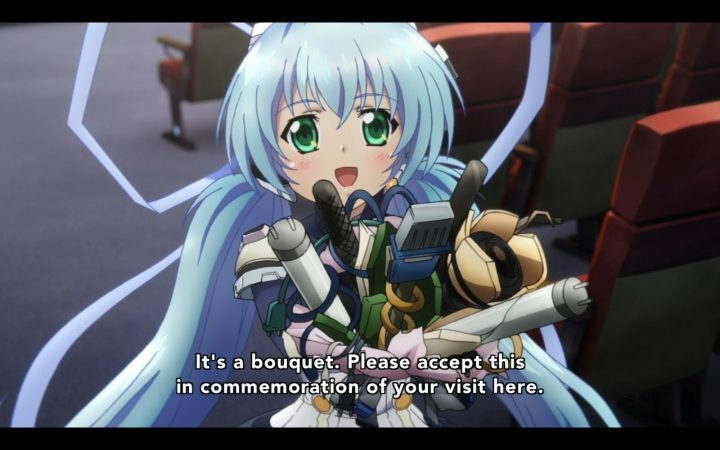 Planetarian certainly doesn’t seek to buck that trend, but if you’re in the market for a tear-jerker, there may not be enough substance here. The conclusion is incredibly powerful and moving, with almost an entire episode’s runtime dedicated to an emotional monologue, but it just doesn’t manage to pull the same kind of response as something like Clannad. 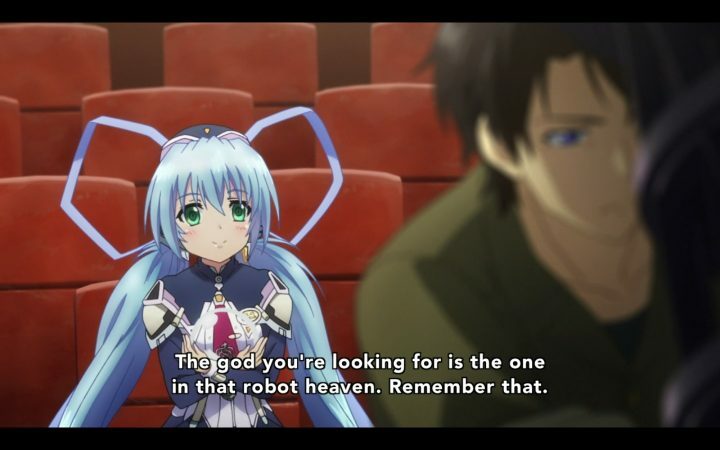 Planetarian was an enjoyable experience, though not for the reasons I was expecting going in. The character interactions were flat and derivative, the narrative static and unengaging, and the pacing wonky and unbalanced. 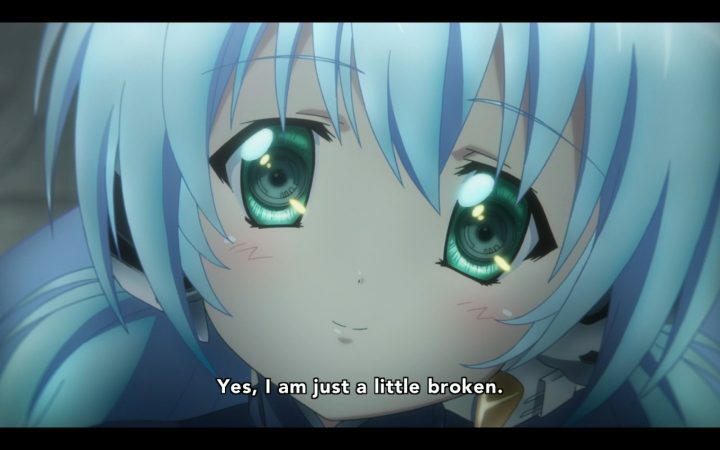 Despite these incredibly significant flaws though, Planetarian presents a great deal of charm, and thanks to a wonderfully scripted and presented conclusion, manages to carry a respectable amount of emotional weight. It’s perhaps not the best example of an intimate narrative on a grand scale, falling rather flat on both counts, but there’s certainly plenty to appreciate.